PSV forward Hirving Lozano has revealed he thinks the Premier League is 'great', stating that he hopes to get a shot at playing for one of the division's big clubs. The Mexican international played the full 90 minutes against Tottenham at Wembley on Tuesday night, as a late Harry Kane goal double saw Spurs fightback from a goal down to keep their Champions League campaign alive. After the match, Lozano, who starred for Mexico in the World Cup, spoke about his long-term ambitions, and his desire to play in England. "I hope that God, some day, gives me a shot at playing in the Premier League," he told ESPN. "I like it very much. I think the Premier League is great. I think that it would be fabulous to play with any of the clubs, but I would love to play for one of the big clubs. I hope that God gives me the chance." He added that he's benefited from the experience of facing the likes of Spurs in Europe, and that his side aren't giving up on their hopes of qualifying for the knockout stages of the Europa League. "My takeaway is that I have gained a lot of experience and a lot of learning. I think I've enjoyed it to the max and I've given my best, and that is the most important thing," he said. "We are going to give it our best shot over the next two matches. I hope that we get a little help from above." 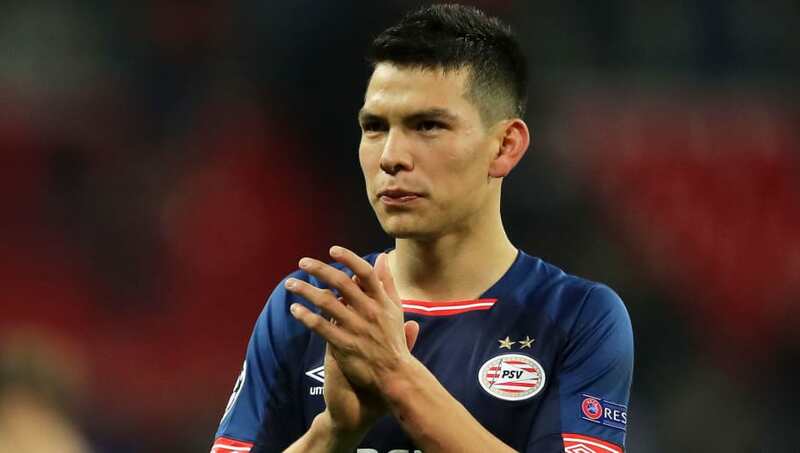 Lozano, along with his PSV teammates, will now turn his attention to finishing third in the group in the hope of securing Europa League football, however, results will need to go PSV's way in order for them to leapfrog Tottenham in Group B. The 23-year-old has scored 11 goals in 19 games in all competitions this season, and should Lozano continue to impress both domestically and on the European stage, interest in his services may be revived from Manchester United, Arsenal and Tottenham, all of whom have been previously linked with m a move.